Watch digital TV on any GNU / Linux notebook equipped with a USB 2.0 port. Just pop in your GNU / Linux TV card, configure it to your liking, and start watching. Supports the digital TV standards used in most countries outside of China! Most customers will receive this item in 1-5 business days with "Standard Shipping" or USPS shipping within the US! Most other distributions which have a recent release are compatible. Reception is dependent on external antennas used (or built-in antenna), distance from broadcasters, and other factors. 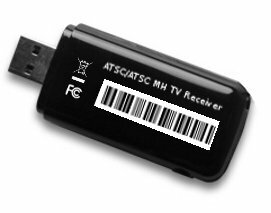 Due to poor support in some distributions and/or versions for TV tuning devices it may be necessary to scan for channels from the terminal. Directions have been posted on our support site at ThinkPenguin.com/support. Are you outside the US? You might need a TV-Tuner Antenna Adapter MCX Plug to DVB-T PAL FEMALE Jack in order to connect the TV tuner to an external antenna. Make sure you select this option if you'll be needing one.